What a week! It's been a lot of late nights for me and my friends this week but well worth it! Honestly - I'm so amped about everything that's going on right now and yesterday I went to bed at 2 and woke up at 7 and was just so excited to get up because I knew I had so many fun things to work on! ...and it's 4am now and I'm still just too stoked to go to sleep! Today my friend Mark came over to do the final filming for the Mexico DVD and I'm so bad at that sort of thing so it took me 5 hours to say my 6 lines but it was so fun! I was so lazy too...I knew the interviews were gonna be a 3/4 shot so I didn't even bother getting outta my pj's - I just put on a shirt. Then Todd came over tonight and he just left a few minutes ago! He's been coding and I've been testing and making templates for Showit Web 2.0 and we have a pretty good beta that will be going out to a very small team of testers over the next couple of days. ...and I just couldn't resist posting this up! I just saw it on the forum! lol - My friends Amber and Nathan Holritz from Tennessee have the cutest kids ever and they're wearing shirts that say "DJ is my homeboy" and "Future OSP addict" - That's so freaking hilarious! I love it! GO to bed DJ!!! lol. Thats so great! The kids pics are fun too. Shyla is so cool she made one for Graycen too. Sooo creative! cool pictures. i have a tshirt just like that. Love that my kids made your blog! WooHoo :) Are they not totally adorable :) Shyla ROCKS! dj, you and todd are truly geniuses--there are only good things in store for you with the new program!! Those shirts are AWESOME!! I love them! Dj in his Jammies...HaHa! Only you Deej. So, for Showit v.3 will you be in full pajama attire...including the nightcap? Aww!! That is soooo cute!!! isn't it the best thing ever to absolutely LOVE what you do every day? 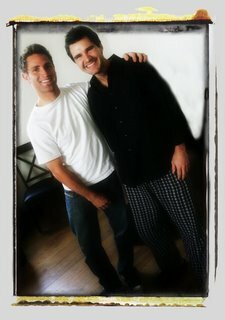 i remember those flannel pants from back when we used to stay up all night editing video! lol...and now I've progressed to wearing them all day too! DJ - It's awesome when you're so excited about life that sleep just seems to get in the way. Cont to fall in love with life. You are a rock star.